Classic Industries offers a wide selection of Brake Components for your Chevrolet Bel Air. Classic Industries offers Chevrolet Bel Air Master Cylinders Components Chevrolet Bel Air Master Cylinders, Chevrolet Bel Air Bails, Chevrolet Bel Air Covers, Chevrolet Bel Air Push Rods, and Chevrolet Bel Air Rebuild Kits and Parts. This side mount unit is designed for vehicles with front and rear disc brakes. Includes wire, plug, and lines. Completely assembled and ready to install. 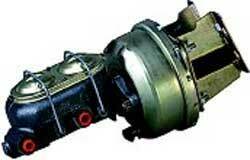 This side mount unit is designed for vehicles with front disc and rear drum brakes. Includes wire, plug, and lines. Completely assembled and ready to install. Reproduction screw-on type master cylinder cap for 1955-56 models. Each cap includes the gasket. Replacement gaskets also available separately. This under mount unit is designed for vehicles with front disc and rear drum brakes. Includes wire, plug, and lines. Completely assembled and ready to install.